For those with a Japanese PlayStation store account, you might have noticed this curious image. Apparently, it's an advertisement for an upcoming Rockman 9 promotion -- a special gift giveaway of sorts. Customers who purchase Rockman 9 between June 24th and July 8t will be eligible to receive either a tee shirt or an unknown PS1 title download. A PS1-era Rockman title, perhaps? Thanks to Jim for the translation. News credit, John via the Mega Man Network. I wish they would do a cool promotion like that here in the states! 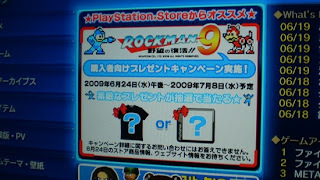 I'll totally buy Rockman 9 on my PS3 for a cool shirt or PS1 title.